Our ancestors memorialised a legacy of themselves that has endured across the centuries, through their art carved in stone, called petroglyphs. Flowing across canyon walls, emblazoning the sides of cliffs, rocks in the desert or on the ground, they display figures that tell us about their world. Petroglyphs are the most ancient and the most stable form of art that humans have ever produced. Ancient stone artists cut into rock by picking, carving, abrading or incising the surface, using stone tools. And in the extreme north, without large expanses of exposed rock, the Arctic peoples created inukshuks, enigmatic stone figures in lonely places, using stacked rocks and boulders. They stand today as a memorial to the hardiness of humans who lived in those inhospitable realms. Our ancestors’ rock art does not just depict daily life, but also paints their view of the creation story. We find the same sorts of iconic motifs the world over, no matter the culture. The show us archetypes of humankind receiving help from the sky gods and goddesses, and archaeologists have marvelled at the consistency of these themes world-wide. Some have postulated that they encode a ritual language of picture forms shared by all humans during those prehistoric ages. Often the art carvings are so huge, and so high up the rock faces, that the artists would have to have built scaffolding, or constructed platforms to hang over the top of the cliffs, much like window washers today. And they would had to have been able to plan their designs out on a small scale and transfer them to the rock, greatly magnified in size. We tend to underestimate the capabilities of our ancient ancestors, but they were just as smart as we are, and mastered the technology of their time, which would be quite mysterious to us now. Hawaii – The ancient Hawaiians carved huge, whimsical figures into the lava fields now known as Waikoloa Petroglyph Preserve. One group deemed to be three hunters, depicts large, masculine stick figures, one of which is holding a shield. The legs and particularly the arms are very elongated. Utah – Ute Petroglyphs in Arches National Park – Nearly everyone has seen these charming figures of men riding horses, surrounding bighorn sheep, and the sheep being herded by dogs. The men have no weapons, and the sheep are not running, so it is possible it is a pastoral scene, not hunting. The cut figures are white, vividly revealed against the dark, purple-gray cliff wall. The Gods – Giant of the Atacama in Chile – The largest prehistoric human-like figure in the world, etched into the side of Solitary Mountain. It is 86 meters tall and believed to be the deity of the people there 1000 to 1400 AD. The arms are raised in what looks like a blessing, with the head festooned with rays. The Nazca Lines in Peru, carved into the hard desert surface, cover nearly 400 square miles and consist of about 300 figures. They are composed of extremely long lines, and were never known as anything else, until they were seen from the air when first flown over. The most well-known are massive: a giant spider, a humming bird, and a monkey, all beautifully executed. There is one that incredibly resembles a modern landing strip. The mystery of how they were done and by who, has never been solved. There is even a persistent theory that because they can only be seen from the air, the artists had to have mastered flight, or they may have even been done by aliens! Petroglyphs are a treasure belonging to all of us. Many countries have taken legal steps to protect and preserve them from weathering and vandalism. This enigmatic art gives us a glimpse into our distant past, and helps us to know who we are and from where we came. Every person on Earth has felt the haunting call of ancient Egypt. That magnificent culture has been captured for the ages in her stone monuments and sculptures. What is so amazing about those artifacts is that they were made with Bronze Age tools. The pyramids, obelisks, temples, the massive, serene statues, the wall reliefs of the gods in all their glory and explained with beautifully cut hieroglyphs, were all done without the strength of steel. One must stand in awe of the Egyptian tool technology which developed their relatively soft copper and bronze tools to such a height of effectiveness. They were experts and really knew what they were doing. Fortunately for us, the Egyptians buried many dignitaries with a good supply of stone carving tools for the deceased to use in the after life. They were made of wood, stone, copper, bronze, and much later, iron. Steel was yet a long way into the future. The critical tool for producing hard metal is actually heat. Iron only becomes liquid at 1,538°C. The Egyptians were able to produce temperatures close to 1100°C, sufficient to melt copper, and also produce bronze, an alloy of copper and most often tin. The relatively short period known as the Copper Age lasted from 4500 B.C. to 3500 B.C. It quickly became the Bronze Age, lasting from 4,000 B.C. to 1,200 B.C. The ages do overlap. Bronze is credited with helping Egypt to dominate the area militarily. Metal iron was known, which came from meteorites, and could be softened by those temperatures, and then hammered into shape. But the heat to produce liquid iron was technologically beyond them. Hammered iron tools only appeared in the much later years of Egypt’s reign. In the earlier dynasties, iron was too rare to be used for tools. The early Egyptian pharaohs referred to iron as “black copper from the sky.” King Tutankhamen was buried with his meteorite iron dagger placed against his breast as his most precious possession. Can you imagine it? All that gold and his prize was a small iron dagger. Wood was incorporated into handles and holders for the metal components. It was also used for mallets for hitting chisels and also striking the stone to break it down. Stone was the first “power tool” ever used by humans to manipulate their environment. Hammerstones and stone axes were not anything like what we use today. Hammerstones and axes were chosen for their hardness, and were chipped to a cutting edge. Often these stones were simply held in the hand. Diorite, the hardest stone, would have been used to work with granite. Stone tools were used for grinding, cutting and pounding. Sand was also used as a polishing agent, being scattered on the stone and then rubbed with a buffer to produce a smooth sheen. Copper stone cutting tools could only have been used with the softest stone like fresh quarried limestone and marble. These included saws, coring drills, chisels and wedges. Drills were hollow tubes and powered by a bow drill – pure human power. Copper saws had very sharp teeth, even jewel tipped. The teeth were angled back toward the handle so the saw could only be operated by pulling it toward the user. Due to copper’s soft nature, edged tools would have to have been sharpened constantly. The mastery of bronze was a huge leap forward. Now they had a metal that was harder than all the varieties of stone. One of the additives they used to turn copper into bronze was arsenic! You have to wonder about work related illness. Jewel points were used on fine cutting and shaping tools to produce the smooth, precision shapes we see in the reliefs and statues, like the giant statue of Akhenaten, created in 1350 BC. How wonderful it would be to be able to go back in time and watch these stone artisans creating these magnificent artworks with their early tools. And how amazed would they be to know that thousands of years down through time the beauty of their creations would still be beloved the world over. 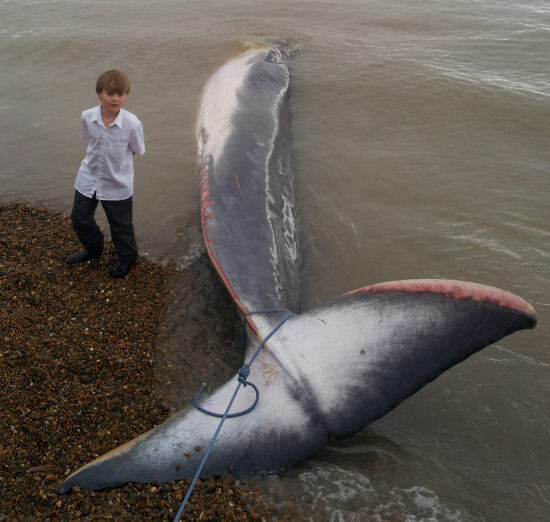 Just recently here at the Shingle Street Beach in Suffolk, a young Finn Whale beached itself. He washed right up on to the beach, and caused quite a big stir about it, and it really got me fascinated about why it would ever do that. They say that its mother also got washed up, but was washed away or had managed to free itself, so apparently the two beached whales were connected in some way. As it turns out, there are a bunch of different reasons why that whale might have beached itself. Most whales that get beached actually died in the water, and were close to the shoreline and washed ashore after death. For other whales, though, they may be close to land and get caught up in tides to get washed up to the beach while being unable to swim back out to sea. That typically happens to older or younger whales who cannot swim as well because they are weaker. Additionally, other whales get beached because, of all things, they were following dolphins into more shallow water and get caught up in tides towards the shore. Apparently, whales like to follow dolphins and can naturally follow dolphins, either for protection or guidance, in many different cases. The following is so tight, in fact, that many marine biologists are trying to figure out if they can train dolphins to guide whales to safety in certain conservation situations! Other whales get beached for a variety of different reasons, like disruptions in their magnetic fields of vision, hunting errors too close to the shore, difficulties in giving birth, old age and infections, and rough weather than can disorient the whales and make them lose track of their position relative to the coastline. Once beached, a whale doesn’t have much of a chance to survive if he doesn’t have immediate help from people on short to keep his body temperature right, and can’t get quickly back into the water where he can breathe, live, and eat properly. The prognosis for a beached whale isn’t good if it can’t get immediate assistance, unfortunately; most whale pods know when a member has beached, and they will call out to their fellow whale in an attempt to rescue him. Whatever the reason, something is wrong when a whale beaches him or herself. I’m sure it’s a sight to see to watch that huge body on the beach, but it’s also sad to know that it isn’t supposed to be there, and whatever reason brings it there means it is suffering in some way while being on land and not in the water. It really makes me sad to know that this little guy beached himself the other week at Shingle Street, but at the very least, hopefully no other little Finn Whales get beached and they can keep being in their right ecosystem living healthy lives within their whale pods and hunting down fish in the ocean! It is ridiculous that Abu Qatada is still in the UK, and that he hasn’t been sent back to Jordan to be tried for his terrorism trials and war crimes. He is a dangerous person and a terrorist who, because of international courts, has been called a refugee. Because of that, he’s been given the right to stay at large here in the UK and live as a free man, since the courts feel he cannot be given a free trial in Jordan. To be honest, though, I don’t think that’s our problem here in Britain. We aren’t an arbiter of courts and international justice when it comes to avoiding life and security at home, and we need to first protect and serve our citizens instead of foreign nationals who may be harboring some sort of security threat towards our people and our government. It is unbelievable that he’s been able to stay in the country for so many years, and that there haven’t been any consequences here except for relatively short prison sentences that don’t do much for his background or goals. He’s been closely tied to Osama bin Laden and Al Qaida, and his presence in the United Kingdom just isn’t wanted. We need him out of the country, since everyone – even up to our own Prime Minister David Cameron – sees him as a threat to national security. Our national security should be paramount to any international decisions we make with Jordan, the European Union, or any other nation or organization. Nothing international should trump our national security and focus on our own people and land. Abu Qatada is a prime example of this, and one area where the courts have really let us down. Sure, I appreciate that they are protecting him from an unfair trial in Jordan, and that would be a serious issues to go through in that nation, but why then must he become our problem and our citizen, effectively, if he has harbored the thoughts and actions of harming the West and working with Al Qaida? Unacceptable! Here’s hoping that this 11-year legal battle that has grown out of this issue will be resolved and taken care of, and that Mr. Qatada can leave our country without any sort of fanfare or any more time spent in London. He might be a threat to our government, and us and it is frustrating that we cannot seem to see the need to have him removed and banished from returning! The man has already been convicted of terrorism charges 15 years ago in Jordan – he’s not only accused, but also a walking fugitive. Why we let him into our country, I will never know, but it is surely time to have him removed for good and deported back to Jordan, or elsewhere to a country that will grant him asylum! Thanks for bearing with me while my site had some downtime. I have switched hosts and platforms. I will reinstate some of my old posts as time goes by. My decision to quit blogger and move over to this format was difficult as I was using the other for so long. I should have switched years ago! Hey ho. Hopefully my blogger regulars will join me here though after being dormant for so long I don’t expect anything. I have a web designer making a snazzy new design for me but he advised me to start sooner rather than later with some new content for the site and he will add the fancy bits later. Even at the simple level of this I have no idea what I am supposed to be doing so I expect I will be looking for a wordpress for dummies type of publication. But, so far, typing is just typing. Any tips and tricks for wordpress will be gratefully received. No doubt I will spend lots of time testing all the gadgets I have already been warned to stay away from certain bits (Permalinks, whatever that is). And what the hell is the difference between a post and a page? I can see I might struggle. So, I will sign off for now and click publish I hope that my few reader will join me here but if you don’t I don’t mind, it’s more for me than for you if the truth is known! Thanks to all my friends for pushing me back to the keyboard.